Peanuts, including peanut butter, are one of the major eight foods that account for around 90 percent of the food allergies in the United States. According to the Centers for Disease Control and Prevention, approximately 3.3 million Americans are allergic to peanuts. The symptoms of a peanut allergy often come on suddenly and can be life threatening. Why Does Peanut Butter Cause Allergic Reactions? An antibody called immunoglobulin is used by the body to fight foreign proteins in foods. In the case of a person with a peanut allergy, the immune system mistakenly believes that the protein in peanuts is harmful. When this happens, the immunoglobulin antibodies trigger a histamine release. This histamine release is the cause of the allergic reactions. A peanut butter allergy can cause a rash or hives. Usually, the rash is red bumps; however, it may resemble eczema. The rash may itch, tingle and burn. In some cases, the rash is limited to only the face or mouth, but it can be located anywhere on the body. 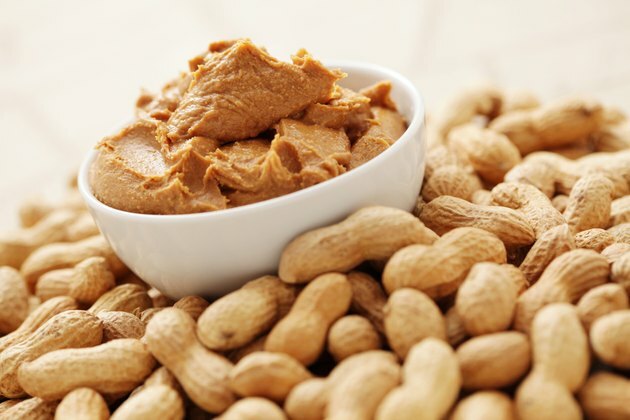 The skin reactions of a peanut butter allergy can be present when peanuts are ingested or when they are touched, depending on the severity of the allergy. Stomach cramps and nausea are the two most common gastrointestinal reactions of a peanut butter allergy. Diarrhea and vomiting are also possible. Generally, these reactions are only present when peanuts are ingested. A person with a peanut butter allergy may experience shortness of breath, watery eyes, wheezing, sneezing and nasal changes, such as a runny or stuffy nose. Feeling lightheaded or dizzy are also possible symptoms of a peanut allergy. These reactions can occur when the peanuts are touched or ingested or if dust from peanuts or peanut shells is inhaled. Anaphylaxis is a life-threatening allergic reaction that causes the throat to swell, which causes breathing trouble. Other symptoms of anaphylaxis include a rapid pulse, shock and low blood pressure. People who have severe peanut butter allergies should be on the lookout for these symptoms. If they are noticed, emergency medical treatment is required. This treatment usually includes a dose of epinephrine.